2nd CD "ROCK N' ROLL DEVIL"
Verits conc.75 is the power trio influenced by Heavy Metal, 70's Hard Rock, Southern Rock, Blues Rock. May. Akinori (Guitar,Voval) and Kyöu (Bass) started to write songs. Dec. Funaki (Drums, ex-DORAID) joined. Jun. 1st Demo was recorded. But immediately after the recording, Makoto left . Aug. 2nd Demo was recorded at Noise room studio. Sep. 2nd Demo was released. Oct. American drummer,Steve joined.And moved our base to Show-nan. Jan. 3rd Demo was recorded, and released in Feb.
Sep. Started the recording session of our 1st album. Jan. Kyöu returned and we continued recording with her. Jun. 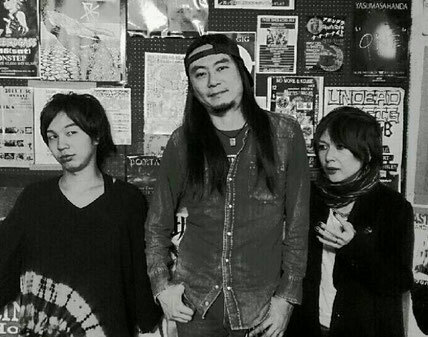 Shigematsu replaced Steve as a support drummer. Feb. 1st Album "The Origin Of The Troubles" was released. Jun. 2nd mini album "Rock n' Roll Devil" was released.